I love making Crepes because they are simple to make and you can put just about anything in them (sweet or Savory). My son even got hooked on them one morning when all we had in the house was eggs and cheese. So I whipped up a couple of crepes and filled them with egg and cheese and that was it, for about a week he kept asking for a crepe. Mix the flour and salt in a medium bowl. Beat the eggs in one at a time. Gradually add the milk, beating until smooth. Set the batter aside to rest 1 hour. When you ready to fry melt one teaspoon of butter in either a crepe pan or a good frying pan over medium heat. Pour in 2-3 tablespoons of batter and swirl the pan to form a thin layer. Cook the crepe approximately 2 minutes until golden brown. Using a spatula to help turn the crepe over, flip it and cook until golden brown. Makes approximately 12 crepes, stack them and keep them warm in the oven. SYRUP; Place the apple cider, corn syrup, brown sugar and lemon juice in a heavy-bottomed saucepan and bring to a boil. Simmer until the mixture has reduced by half (about 10 minutes) Remove from the heat and stir in the butter. Set aside. FILLING; Melt the butter in a medium frying pan over a medium heat, add the apples and cook, stirring often, until the fruit is tender but not mushy, about 5 minutes, Sprinkle with the brown sugar and simmer until caramelized and golden. 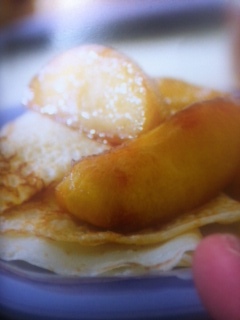 Divide the cooked apples into the crepes and drizzle with the syrup. Top it off with a good size dollop of whipped cream.